Mr. Happiness beckons the Mrs. 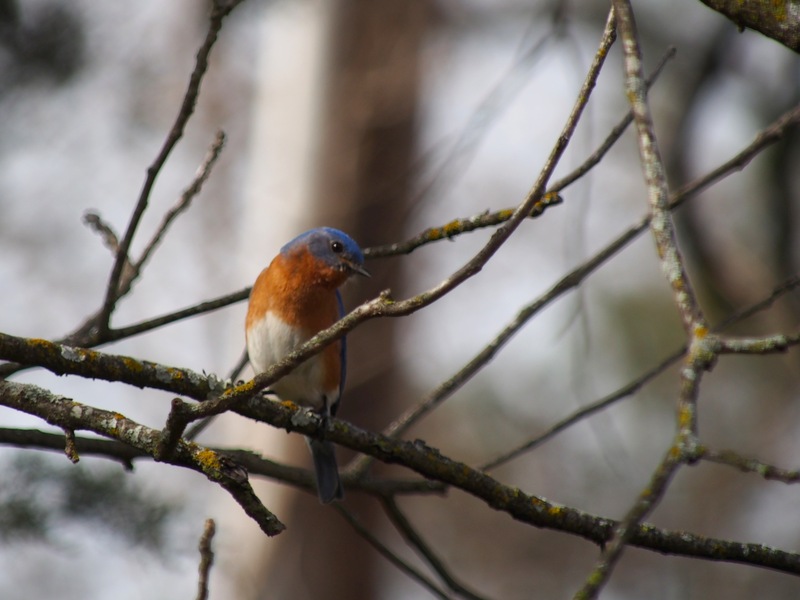 This entry was posted in birds, Ozarks, Photography, wildlife and tagged Arkansas, birding, birds, bluebird, bluebird of happiness, color, eastern bluebird, Eureka Springs, Olympus, Olympus E-M5, Ozarks, photography, wildlife by artsifrtsy. Bookmark the permalink. Thanks Val. I put these up in June of last year and got no takes, I was 3 months too late. I actually have 2 pairs in separate houses and the males stare each other down from opposing trees. I guess these guys stay east of the Rockies. I never thought In Nevada we had mountain bluebirds – smaller and more vivid. Great shots and editorial, love it all! I love these little guys. The color doesn’t even look real…..which is what makes them even more amazing! Great shots!!! Thanks – I love that pop of color. 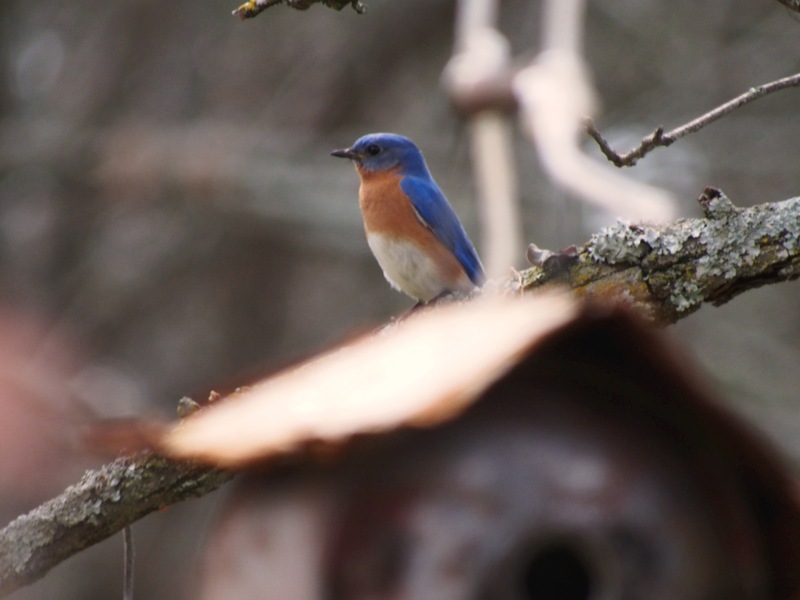 We had mountain bluebirds in Nevada that were the loveliest shade of blue – so vivid in the desert. I “thought” I saw a bluebird here today…..but off he went before I was 100 %. Next time…. Then we’ll say he was a bluebird!!! 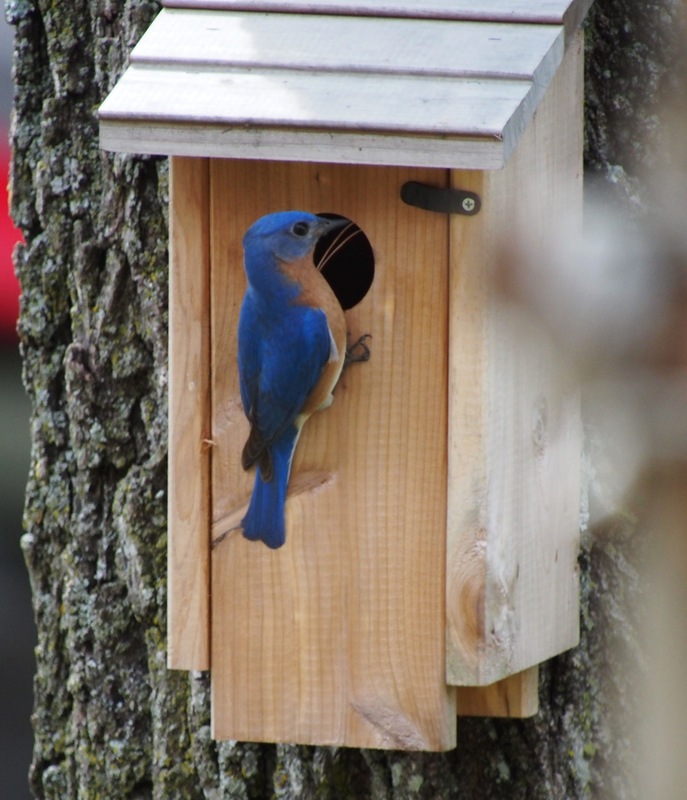 I usually see bluebirds every year….but not yet. I saw the first one if the year out on the lane a couple of weeks ago – these were a surprise yesterday. 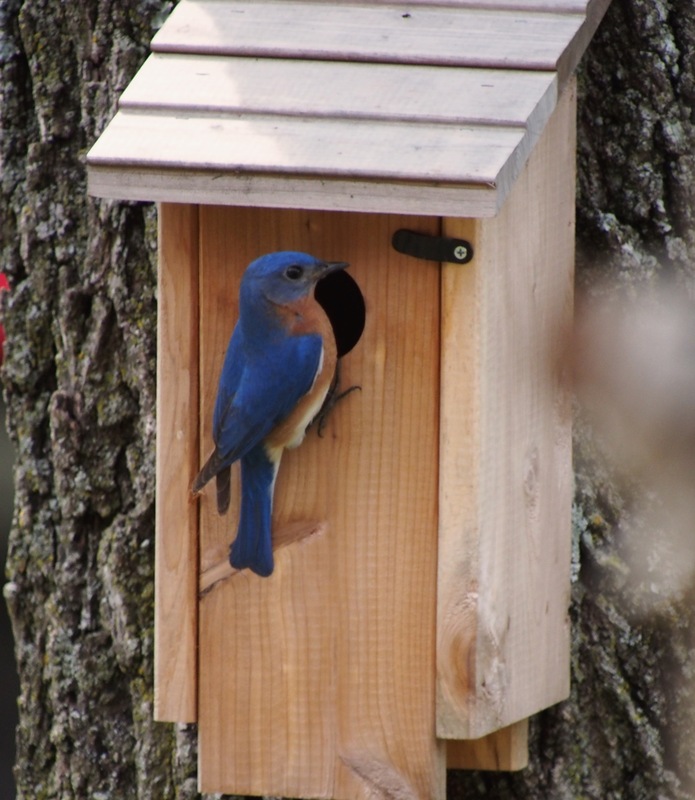 Those bluebirds are lovely and I love the captions you wrote. 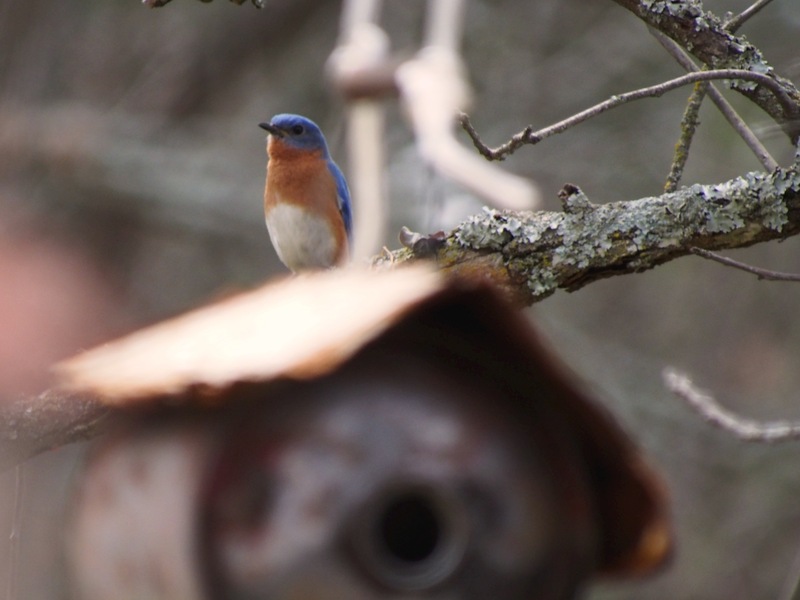 Will look forward to seeing some little bluebirds through your camera lens soon. (it’s blowing a gale here today – more like Winter than Autumn). The first day of Spring and it’s looking like snow in the morning – go figure. 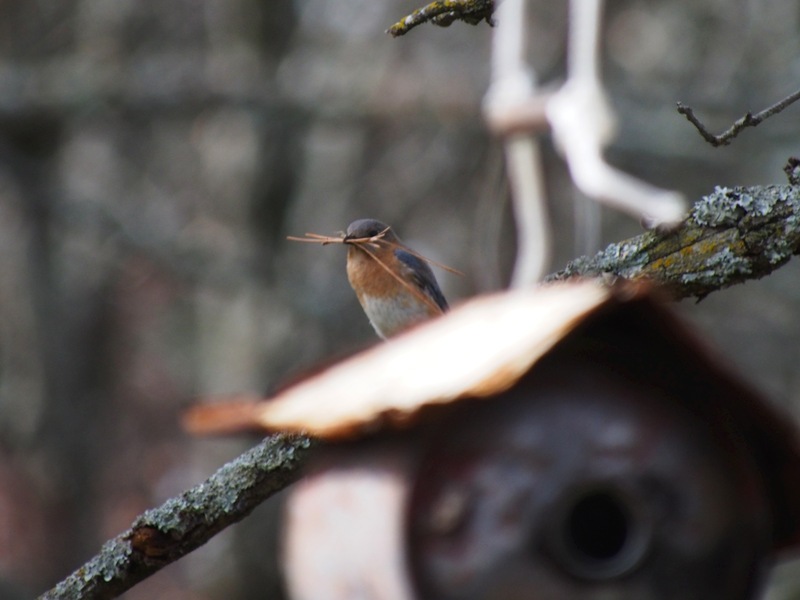 I am pretty excited about seeing babies – so far 2 houses are occupied by bluebird pairs. There’s something mesmerizing about a vividly colored bird in the woods. HAHAHA! Love it! Your photos and tag lines are terrific. Good fun. I wonder if there are ever any squabbles about who gets the posh house? No one’s been willing to move into the oil can or the trailer house – so it seems there is some type of hierarchy. Wonderful pictures, as always Lorri. And perhaps you should add scriptwriting to your resume as well! I had to learn shorthand when my parents forced me to go to secretarial school. What a waste of time. I don’t remember a thing! My Nana knew shorthand. It was like secret code. I thought it was cool. Thanks Jackie – I hope I get the place filled up – I put up about 6 boxes last year that saw no action – two are filled so far. My understanding is that the boxes have to weather a season before they will nest. My dad always had boxes for them and that’s what he told me. I figured it must be true since when ever he put new boxes out they wouldn’t have tenants till the next year. 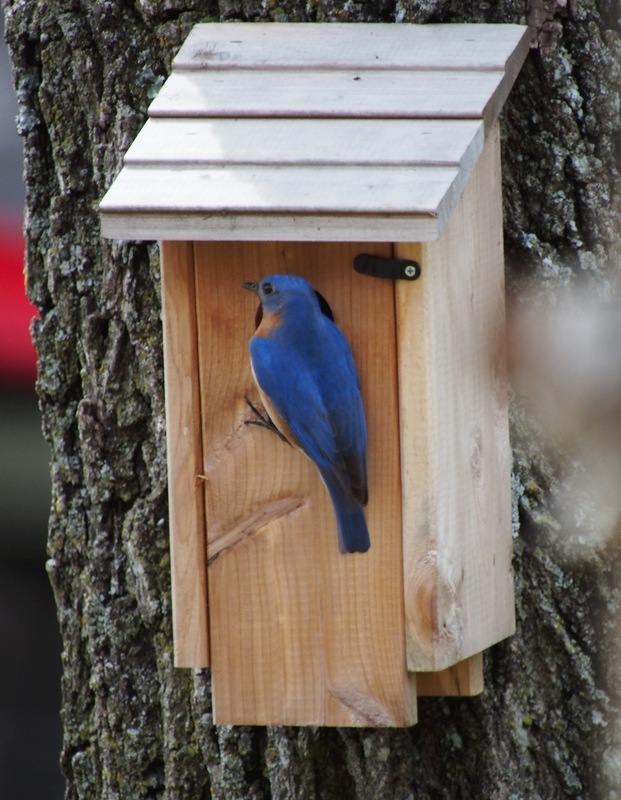 Wisconsin has a bluebird program to help the birds thrive. metal may be different then wood. I know wood has to weather, hmm not sure about metal. It will be interesting to find out. I also have a nifty airstream trailer – mostly wood though – maybe next year. 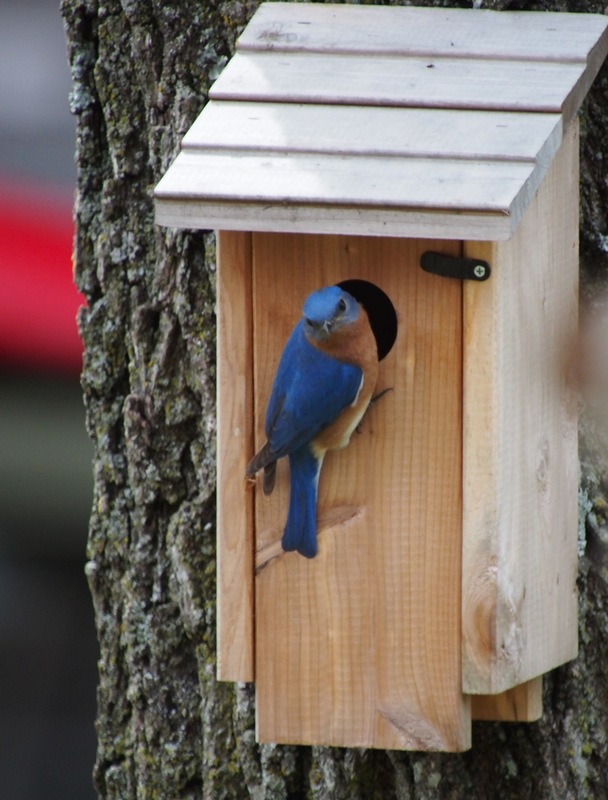 Thanks Kathleen – I was so thrilled to see them – never had bluebirds here before but the houses must be attractive to them. I put them up last year too late in the season so it was exciting to see them being occupied. I can’t believe we’re getting more snow – tomorrow and Saturday too – yikes! Wow! Lorri, you have a gift! Well I don’t know about that, I put up these houses last year and they saw no action so it’s cool to see them in use. I have been wondering about your chickies in the jug – how are they doing? You do. Creating an habitat for all of the beautiful creatures, capturing their images AND their conversations. THAT is a gift! You are the Bird Whisperer. The mama here is hunkered down. Her brown body barely visible inside the jar. I’ll try to catch a shot without disturbing her. She’s kinda mouthy when we get too close. It shouldn’t be long now before the hungry squawking begins. Maybe not so much of a whisperer as an eavesdropper. 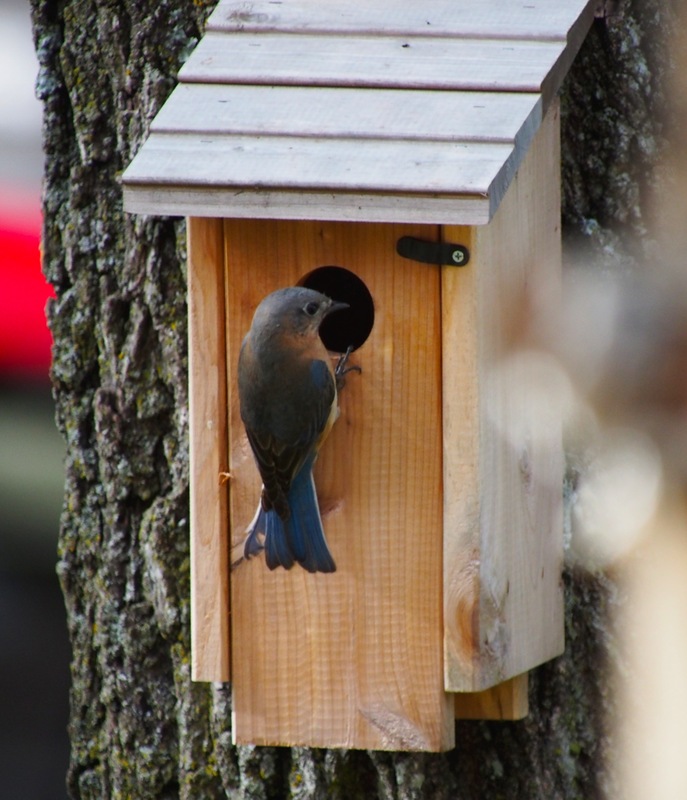 I am wondering if some chickies have moved into some of mine without me noticing – I actually hung the boxes for them. 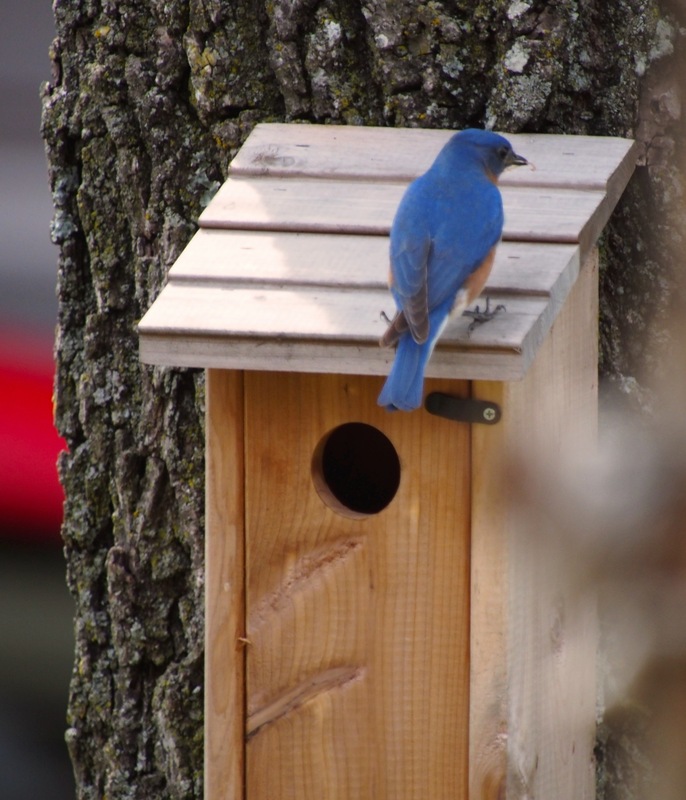 The labels said bluebird houses so I guess the bluebirds know the difference. 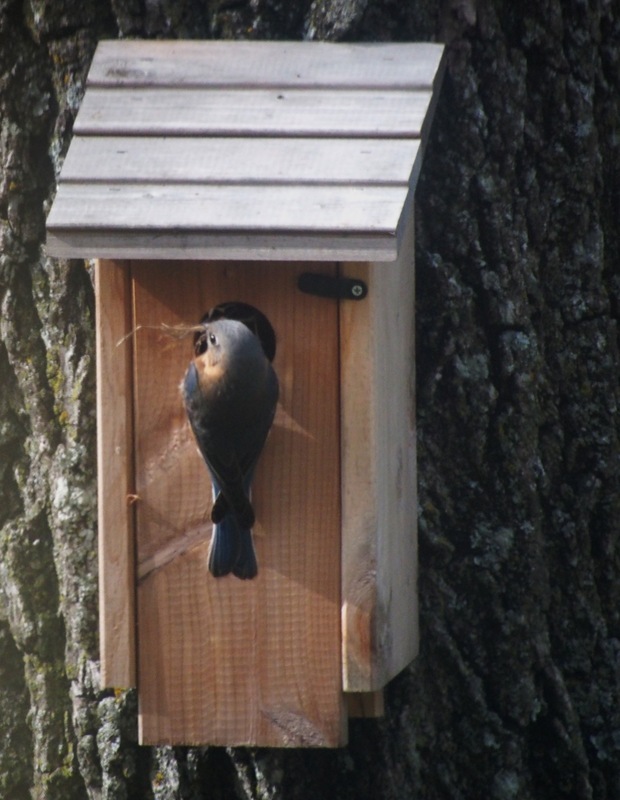 The lady at our wild birdseed place said its the size of the hole they seals the deal for them. Hmmm – I have just hung houses pell mell in the trees. So far the tall cedar ones are the only ones occupied. Yeah, those bluebird mamas are predator conscious. 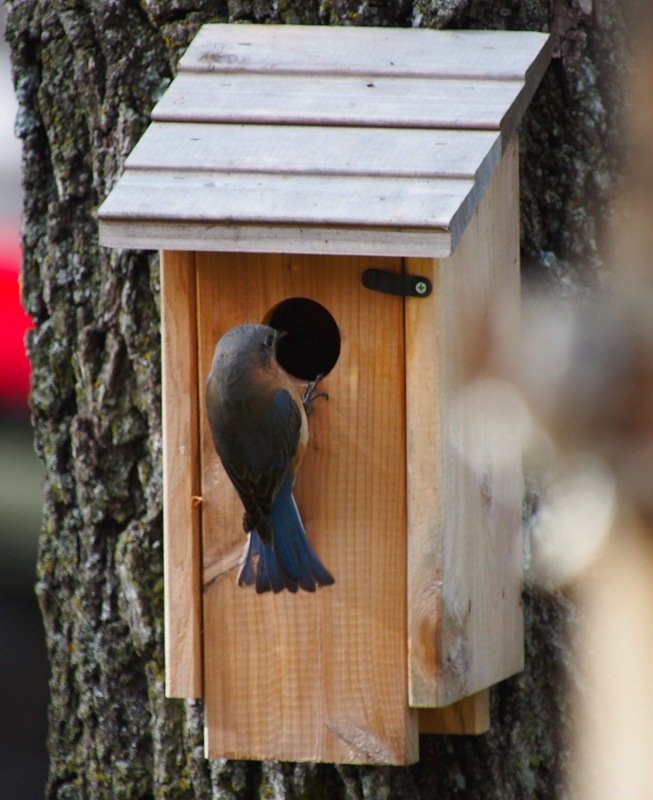 I found a hole size chart and a site with birdhouse info this afternoon – it looks like mine might be a bit closer together than suggested but the two long boxes are occupied. I can see how the tall box and small hole gives them more protection. I also read that the smaller hole keeps out starlings. Beats any soap opera any day! Good choice on housing, Mr. and Mrs. Happiness and future littles will do very well there. I think so too – I can’t wait to meet the younguns.